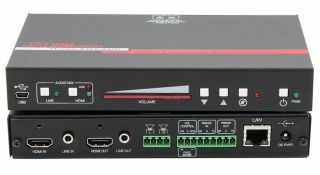 The EMX-I-AMP by Hall Research is a 4K HDMI audio extractor with built-in 50 watt audio amplifier for direct connection to 8 ohm speakers. The device provides a separate stereo input for connecting a wireless microphone or audio player. HDMI audio is mixed with the analog audio input and amplified. Output volume can be controlled via LAN, front panel buttons, RS-232 commands, or using a remote wall-plate with a rotary knob. An independent RS-232 output port is provided in order to control other devices such as TVs or projectors.